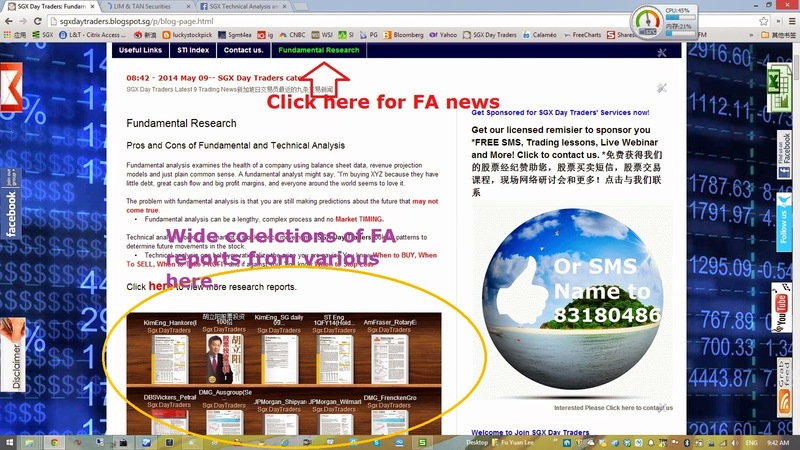 SGX Day Traders: 2014 May 12-- #sgxdaytraders share some FA reports from various broking houses now. 2014 May 12-- #sgxdaytraders share some FA reports from various broking houses now. 2014 May 12-- #sgxdaytraders share some FA reports on from various broking houses now.We are purely TA traders, but we also never forget to read FA reports because when FA meet TA, the power is real greats. Fundamental analysis examines the health of a company using balance sheet data, revenue projection models and just plain common sense. A fundamental analyst might say, "I'm buying XYZ because they have little debt, great cash flow and big profit margins, and everyone around the world seems to love it. The problem with fundamental analysis is that you are still making predictions about the future that may not come true. • Fundamental analysis can be a lengthy, complex process and no Market TIMING. Technical analysis looks at a chart of a stock's price movements. SGX Day Traders look for patterns to determine future movements in the stock. • Technical analysis can help you rationalize the price you are paying. You know When to BUY, When To SELL, When to Take PROFIT and if against you, You know When to Stop Loss.